That weirdness in the air? It’s called evolution. I wanted to write about last week. Relate this piece to my book. But I decided against it. Then there was Boston. Through the world of social media and real-time updates, I got to discover so much through my connections’ personal ties to that city. The explosion in Texas: I knew about this catastrophe because I glanced at Facebook maybe an hour after it happened. A friend who grew up in Dallas posted about it. But the main thought behind this column isn’t about any of these moments from last week. I don’t know what I can add to those conversations right now. Though my thoughts and prayers do go out to those more closely affected than me. Thing is, in an ancillary way this column is about all of the things I mentioned above. No, it’s about how these events happen and how quickly we learn about them and how interconnected our thoughts are now when it comes to events like these—and how this is actually a good thing. We’re just still adjusting to this new reality. We’re changing. We’re outgrowing that representative image at the far right of the diagram above. It’s time we update the evolutionary chart. That changing line of humanoids that marks our advancement over the course of time, we need to add another person to the front. Because—even if you want to argue that we still physically are that person—you can’t deny that we have advanced as a whole society to the point where we are noticeably different from, say, even the early to mid-20th century. Our grandparents’ and great-grandparents’ era. Those people? They were like the crossover, the last of the group represented by the farthest-on-the-right guy on that chart. They were the last of his kind, and yes they represented well. That group of people who understood the horror of World War II, for this sake of this piece I’m thinking of them as the crossover group. That guy at the far right, this group did his kind proud. But our problem right now is that we still want to be like them more than we actually are. The crazy part is that if this group were still alive, they would be telling us to quit doing this as well. They’d tell us to look forward. It’s time to revise the evolutionary chart. That guy at the front needs a new person ahead of him. I recommend we make that representational image of mankind’s new evolutionary step a woman. Right in front of the guy, taking her own step forward, a female image. We’ve outgrown that old evolutionary chart. Updating it with a female image might help reframe how to deal with this overload of craziness. To state that we have now reached the point as a race of beings where we have a woman at the head of the evolutionary chart to represent the change from the previous stage. And there’s not much more reason than that. As a group of beings that is advancing, we are advancing past the point of obsessing over the gender of a representative image on a chart. Look around, at the environment, potential catastrophes, global food and water shortage possibilities. In the next few years, we humans will have seriously important things to worry about. And don’t say that less developed parts of the world don’t apply to this idea. Look at the Arab Spring, social media keeping all of us connected to the Middle East on levels never possible before. People in the third world can tell us about their lives through technology. Earth’s poorest areas—North Korea, places in Africa, India, Afghanistan, yes, those areas are different. But the fact that we can achieve almost real-time knowledge about those areas through satellites and other technologies is proof that we are all connected and those people are indeed more a part of our lives than we know. Our closer connection to each other is forcing an evolutionary change. That’s what we are all feeling right now. Growing pains, adjusting the ways we operate, forgetting some lessons that were taught to us when we were younger—no—figuring out which lessons from that bridge group are worth keeping and which ones are worth forgetting. Those forces sound stressful. It’s okay if we’re all freaking out. We are undergoing change on a grander scale than any other point in modern history. We are evolving. As stressful as it may seem—last week being yet another hit of pain that we didn’t see coming—still, this is what we are doing. We’re just not okay with that idea yet. Update the Evolutionary Chart. Make that metaphorical representative for all of us a female. 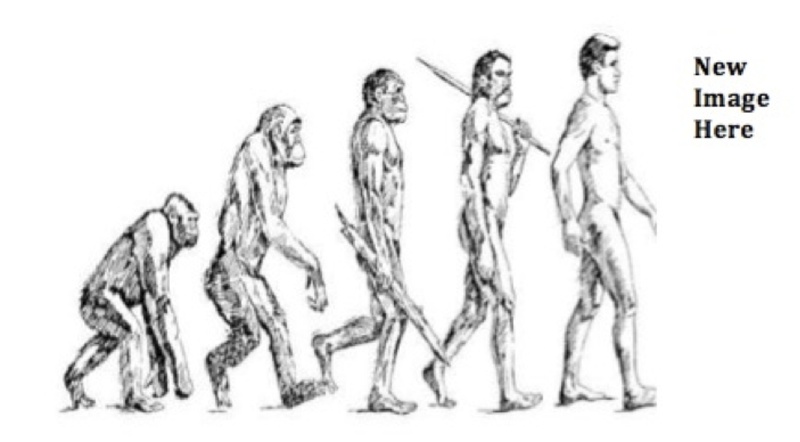 To say that we have advanced beyond the point of the previous person on the Evolution Chart and are people who are okay with that representative figure. Even those parts of the world where women are treated harshly, I have faith that these places will change in our lifetimes. Who knows how far they will go, but progress is inevitable. Maybe a woman in a third-world country who was never taught to read or write will look at some picture of this chart and begin to wonder why a woman’s image is at the front, who knows? Maybe she’ll discuss things with her daughters and they will grow up a bit more free. One can speculate. Regardless, that sounds like evolution. Maybe our problem right now is that we have evolved to the next stage and we don’t know it yet. The pain we’re feeling, the violence that seems to be getting worse—that’s us collectively moving forward. We have good days and we have bad days. And some steps are painful. The key is to keep stepping. Update the Evolutionary Chart, with the image of a woman. To communicate to the aliens and other forces of the Universe that humanity has advanced to the point where we have an image of a woman on our Evolutionary Chart. Maybe they’ll see this advancement and pay us a visit. ← Nacchio: should’ve been a Wall Streeter.